Addams, Charles (1912-1988) Original Art for a New Yorker Magazine Golfing Cartoon, 16 January 1954. 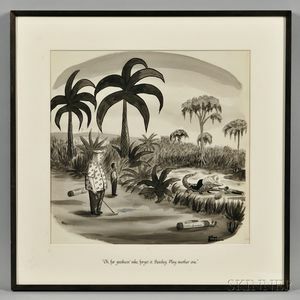 Addams, Charles (1912-1988) Original Art for a New Yorker Magazine Golfing Cartoon, 16 January 1954. Ink and gouache on watercolor paper, in black-and-white, signed in lower right corner, with mark-up in pencil for publication; titled, "Oh, for goodness' sake, forget it, Beasley. Play another one," on the mat; the image depicts a golfer straddling an alligator, holding its jaws open, while his caddie uses a golf club to retrieve the lost ball; the golfer who provides the caption and caddie look on in dismay, 17 x 17 1/2 in. Adams, John (1735-1826) Four Language Ship's Passport, Signed, 12 January 1799, as President. Adams, John (1735-1826) Signed Legal Brief, 5 December 1770. Adams, Samuel (1722-1803) Document Signed, 20 December 1779. American Broadside, A Short Account of the Troubles that our Fore-Fathers met with to obtain this Land. Armstrong, Neil (1930-2012) Signed Program, Kitty Hawk to Tranquility. Astronaut Signatures; Signed Sheet of Project Mercury Stamps. Battle of Gettysburg, Contemporary Epistolary Account, 2 August 1863.